Match types allow keywords to target search terms in different ways by allowing for variations between the keyword and the search term. So intrinsic to the account, and typically the underpinning structure, that match types define campaigns and ad groups, we discuss this more in an article on account structure. Typically most to all keyword match types will be used in an account, in a structured way so that the most relevant ad is always being served and all relevant search terms are being targeted. Keywords when added to an account and that are eligible to run, essentially trigger your ads, showing them in the Paid SERPs when someone searches (that search is often referred to as a ‘search term’ or ‘search query’). The aim, in many respects, is to serve the most relevant ad for any given search term and gain that click. Unless you add every possible variation of a search to the account, there arises a need to match groups of search terms to keywords. This is achieved through the four possible variation of match type describes below. This is all linked to how Google matches searches to intent and how that impacts matching a search term to a keyword. Keywords on the display network; your keywords are matched to page content rather than a search query. Display network keywords are always set to broad match and consequently include a wide range of variation between the term being matched on the page and the keyword. Negative keywords can be used to limit this exposure in the same way as on the Search network. The default match type for keywords when being created is broad match, unlike some settings this is one that does not have to be set by the user... In that, if no changes are made, the keyword will be broad match. The only exception to this is if a keyword is copied or cut from elsewhere in the account, in which case the default match type will be the same as the copied or cut keyword. When importing keywords on bulk from CSV files you can specify the match type, failure to specify the match type will result in the keyword being added as broad match. Exact Match keywords trigger ads when someone searches for the exact keyword you are targeting, but will not show for variations of it. For example, if you target ‘red widgets’ as a keyword, someone would have to type into Google exactly ‘red widgets’ for it to trigger an ad. Plurals and misspellings are now included within this if Google thinks matched the user intent. This has been the case for some time now, it used to be the case that exact match meant ‘only exact match’ and nothing else. This often limited exposure and often a plural or misspelling has the same intent as the exact match keyword. Exact match keywords limit the potential audience to those searching for the keywords you have chosen, if these keywords are relevant, so should the traffic that they deliver. There is less management required for exact match keywords; no negative keywords are required & not much by way of search terms to review. This is the narrowest way to target potential customers, limiting your ads to show in the least number of instances; consequently, this can lead to missed opportunity in terms of impressions, clicks, conversions and revenue. Exact match keywords can only be used on the Search network. Phrase match keywords widen the net allowing less relevant search terms to trigger ads. This means that your ads will be limited in how relevant they can be to the search terms that trigger them. It also means you will get more traffic from these terms. As you can see, replacing the keyword ‘red widgets’ with almost any other product or service could lead to a lot a impressions (Views of your ads) for searches that are not relevant to the landing page, ad or keyword. Moreover there will often be a more relevant landing page to deliver traffic to for some of these search terms. Adding negative keywords limits the search terms that will trigger your ads, we discuss this topic in more depth in another guide. This can only be used on the Search network. Phrase match keywords are a good compromise between broad and exact match keyword, allowing your ads to be triggered by a larger group of search terms. Phrase match keywords are (when implemented properly) still often triggered by very relevant terms and can help identify other search terms to target. This can be done by reviewing the search term report. Largely made redundant by broad match modifier in many instances. Required small amounts of negative keyword research to limit exposure, especially on common two or three word phrases. Requires more additional management than exact match keywords. This is the default match type for keywords in AdWords. Broad match keywords are the most volatile, allowing a very large range of variations in search terms to trigger ads. Hence, using this match type will allow for any of your initial keywords can trigger ads for drastically different search terms. Pretty much anything Google thinks might be relevant could potentially trigger your ads. This is very damaging to account performance and can waste money on irrelevant searches that result in clicks. This also impacts overall relevance and Quality Score, both of which we describe in more detail below, but it will suffice to say that this will continue to worsen account performance. The most common mistake beginners make is to have every keyword set to broad and have few too no negative keywords in the account. Read our guide on negative keyword research to get a better understanding of why this is so important and how to do it. Campaigns using this match type will start to build ‘search query lists’, which is a list of all search terms that triggered your ads that resulted in a Click. This is great for account expansion, but you cannot see what search terms triggered your ads that did not result in a Click... These are the terms that need to be excluded with negative keywords. Broad match keywords are a great for finding out related search terms, from within the search term report. This can lead to account expansion and refinement. These get the most amount of impressions and allow for the broadest range of search terms to trigger ads. Broad match keywords are often cheaper than exact match keywords. Relevance can be difficult to maintain for less experienced users, driving down account efficiency. You cannot see what search terms did not trigger impressions, but these could be very varied. As the default match type, the most common mistake beginners make is to have every keyword set to broad and have few too no negative keywords in the account. Read our guide on negative keyword research to learn more about why this is so crucial and also find out how to actually do it. Requires lots of negative keyword research. Requires the most amount of additional management to ensure account performance is maintained. 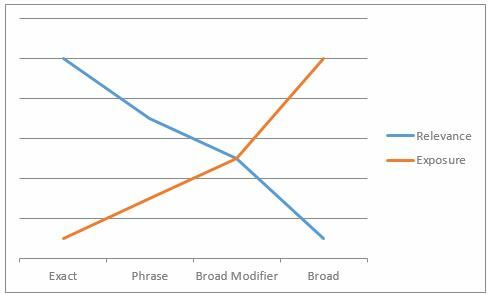 Broad match modifiers are represented by adding a plus sign (+) to the beginning of words within a broad match keyword. Hence, the keyword must be set to ‘Broad match’. This is a powerful tool and in many ways removes the need for Phrase match keywords in accounts. Broad match modifiers change the properties of the word (within the keyword) to which they are applied. When applied to a word they prevent Google for changing, removing or substituting that word... That word has to appear within the search term. For example; if we have the keyword ‘red widgets’ and we add a plus sign to the word ‘widgets’, we get this: ‘red +widgets’. This would mean that ‘widgets’ has to appear within the search term, but ‘red’ could be changed, substituted, removed, etc. Hence this form of keyword can massively limit the exposure of your ads to less relevant terms in most cases (where the keyword has three or more words). This does not remove the need for negative keywords, but does reduce the amount of them you need. Thus this strikes a great balance between exposure and relevance. Broad match modified keywords are a great for finding out related search terms, from within the search term report. This can lead to account expansion and refinement. But they do this in a more controlled way than with broad match keywords. These get the second highest volume of impressions and allow for the second broadest range of search terms to trigger ads. Not as much additional account management is required to manage this as with broad match keywords. Some negative keyword research is required. More additional management is required than with exact or phrase match keywords. As mentioned, all match types have a function and thus their place in an account is determined by the objectives and goals of the account owner. Whether its branding, direct response, an ROI strategy or simply trying to grab some market share, will determine what match types are used and how. *Note: We only really discuss account management in this guide as ‘additional account management’ because all accounts and match types require management.